A business can fail in many ways, but not making it off the launch pad and not reaching its full potential are two of the most difficult to watch. The unfortunate truth in the matter is that many businesses fail. Measuring and understanding why so many of them fail in the traditional sense is relatively easy; we have plenty of data to point us to where things went wrong. Organizations such as the Kauffman Foundation and the U.S. Chamber of Commerce have analyzed years of statistics, giving us a solid idea as to why almost 75% of businesses don’t make it past the 15-year mark. Some of the biggest reasons for failure include undercapitalization, overexpansion, poor-planning, and a declining market. So we know why so many businesses tend to sputter and fade, but that doesn’t tell the whole story. Many businesses fail in a much quieter sense. One mistake that business owners often make is thinking that staying in business, keeping their doors open, makes them successful. Yes, lasting for five years is impressive, but it’s not really an indication of success. Instead, what you can do from the get-go is plan ahead, be ambitious, and think big! Pushing yourself to be all you can be is the difference between scraping by and running a truly successful business. From day one, you should make sure not to fall into the trap of doing everything in the business yourself. Instead, choose to work on improving and developing it to be the project you’ve always dreamt of. A successful business runs on processes while a successful agency runs on people. The unfortunate reality for millions of entrepreneurs around the world is that their businesses depend on them way too much. You know the type: they’re overwhelmed with their business and are in charge of everything from taxes to taking out the trash. They work nonstop, not because they want to, but because they have to. If you don’t think you’ll have the revenue to hire a team to complete all of the various tasks required to run a private jet taxi service, your business may not end up being profitable. This is the best time to take a good, long look at your vision and consider a different approach. Making yourself responsible for everything in your business leads to quick burnout. Not only that, but it prevents you from properly operating in your role as an entrepreneur. Again, make sure you’re working on your business, not in it! Short deadlines are extremely stressful, but they may be just the motivation you need. The best entrepreneurs deliberately create an atmosphere of urgency because they know that people are not as likely to get much done in a relaxed environment. Just take a look at Steve Jobs, the cofounder of Apple. He was notorious for pushing his team beyond its limits by setting seemingly unrealistic timelines. But, as a result, his company created products quicker than they ever thought possible and gained a huge competitive advantage over their rivals. So, there you have it. Dream big, work on your business, and make the most of your time! 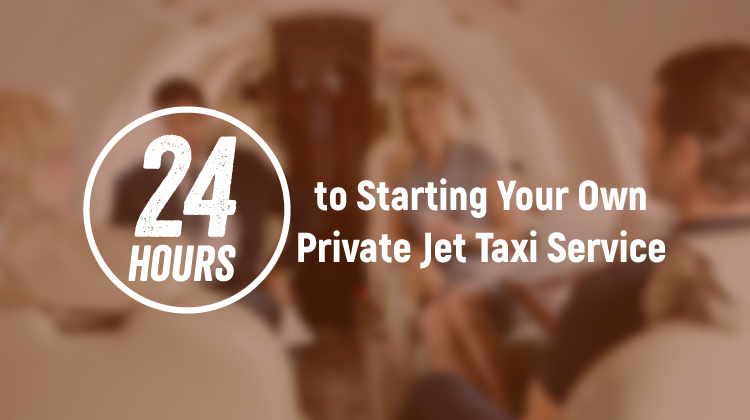 It looks like giving yourself a 24-hour deadline to start your own private jet taxi service might not be such a bad idea after all!